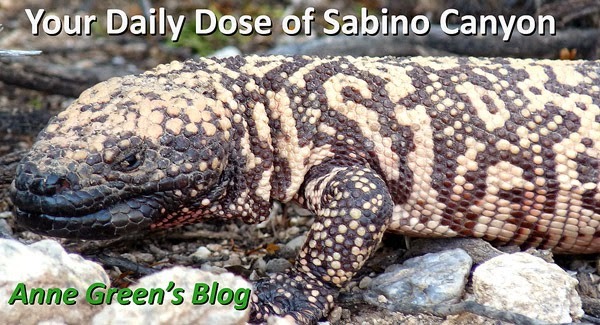 Your Daily Dose of Sabino Canyon: It's alive! Note the dark stuff. It's holding the soil below. Desert dirt is very cool! Peggy Wenrick instructed the Wednesday Nature Walk on cryptogamic soil. (Crypto = hidden, gamic = usually: reproduces sexually, from the Greek for 'marriage') She even had a handout! You'll have to settle for a link. Basically, these crusts are living soil, composed of cyanobacteria (aka blue-green algae), other algae, cyanolichen, and mosses. Each species helps bind the soil. This takes a LONG time. Potentially more than one hundred years to form soil like in these photos. Take home message: STAY ON THE TRAIL!